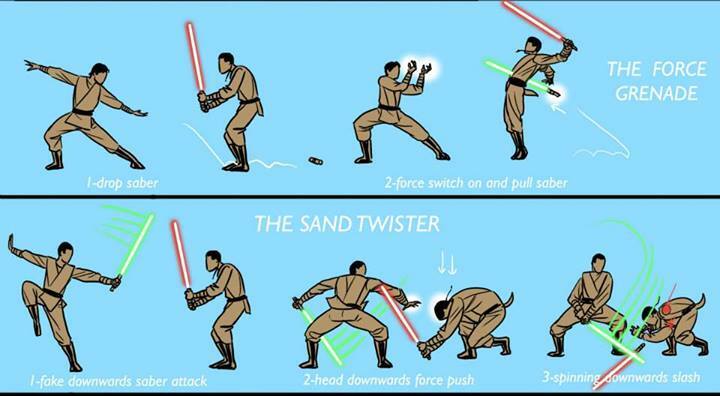 Lightsabers are really, really different from modern swords. They have weightless blades, will cut through their targets independent of velocity, and can be turned on and off fairly quickly. In light of these differences, it seems silly to expect battles between two masters of the weapon to resemble duels between swordsmen of earth. It seems even sillier to expect them to resemble Hollywood sword fights full of clashing blades, kicks, flips, and villainous monologues. Given the differences between them and swords, what would be the best way to duel with a pair of standard Star Wars-physics lightsabers? I have thought about Jedi duels a long time. I may have obsessed a wee bit much in this answer. In the Star Wars universe, only Jedi and Sith use lightsabers as weapons because they're just too dangerous to use unless you have some level of prescience from your attunement with the force. Only a handful of individuals are known to wield a lightsaber without force attunement, and those who did so in combat did not last long (see General Greivous). Accordingly, I will presume your fighters have some Jedi like skillsets to avoid killing themselves by mistake. Jedi and Sith alike are known for their long game. The Jedi order sought to maintain balance for thousands of years. Darth Sideous had the gumption to fight two sides of a war for years before assuming ownership of the winning side. A Jedi or Sith will leave nothing to chance. Accordingly, we can rely on them to never act in a way which can perceptibly increase their chance of losing their long term goal. You won't see a Jedi or Sith make an attack that has a 95% chance of killing the other person and a 5% chance of getting stabbed themselves (unless killing that person is their long term goal or their long term goal can be achieved after death). Allowing random external influences to negatively affect their long term goals just isn't in their nature. Jedi and Sith trust the force, not dice. Instead, they will put themselves in positions which make their odds look more and more likely until they are convinced they have a 100% chance of achieving their long term goal -- and if that involves killing the other person, they will. The force does not give perfect information, or if it does, it requires a perfect person to listen to it fully. 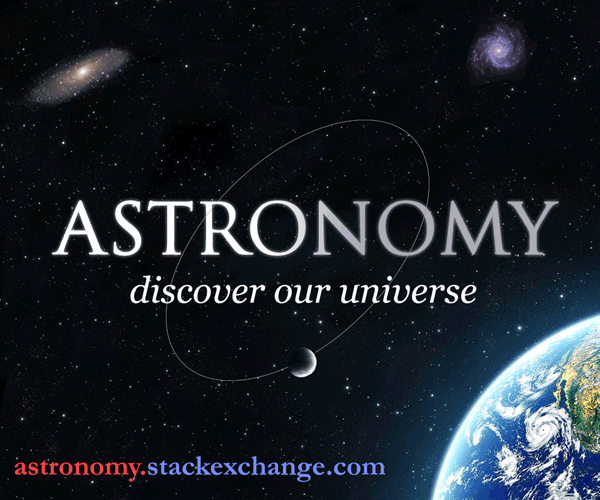 So let's set some ground rules for what a force-aware person can sense. We note that Jedi can deflect blaster bolts, which suggests that they can be aware of the physical state of their opponent. Whether it's the position of an ankle joint, or the direction of a blaster, they're likely aware of all of it. However, intent is trickier. It is noted that Jedi mind tricks only work on the weak minded. Canon Star Wars doesn't specify what this means, so I'll define it in a way which is convenient for talking about combat as a game. I will define "intent" to be a plan to control a state, such as the physical state of the opponent. For instance, if you have the intent to punch someone, that intent will guide the muscle contractions required to develop a high velocity in your fist (the physical state) towards them. This concept of intent is recursive: we can have an meta-intent shaping intent. For instance, you could have an meta-intent to win the fight, which shapes the intent to punch someone, which shapes the muscle movements needed to strike. A strong minded individual will be defined to be one with many layers of intent, like an onion, or one with very sharp and focused intent. A weak minded individual will be defined to be one with few weakly focused intents. Jedi and Sith are limited in the number of layers of awareness they can pierce, and by the sharpness of those layers. This is perhaps contrived, but it does line up well with the canon. If Obi Wan is sufficiently attuned to the force to be aware of all the layers of intent in the mind of a Storm Trooper, he can identify the exact set of motions which will exploit a weakness in that storm trooper's mind. If the storm trooper had a stronger mind, he'd have been unable to do so because a higher level of intent (which he is insufficiently aware of to influence) will catch his Jedi mind trick, and "correct" it. Alternatively, consider Watto, who clearly doesn't have many layers. He may not have many layers, but the layers he has describe very clear intent (to make money, mostly), so its hard to find a way to influence him without being detected. (I'd theorize that Qui Gon could have completely dominated Watto's mind, wiping all intent, but that'd be against the ways of the Light Side). 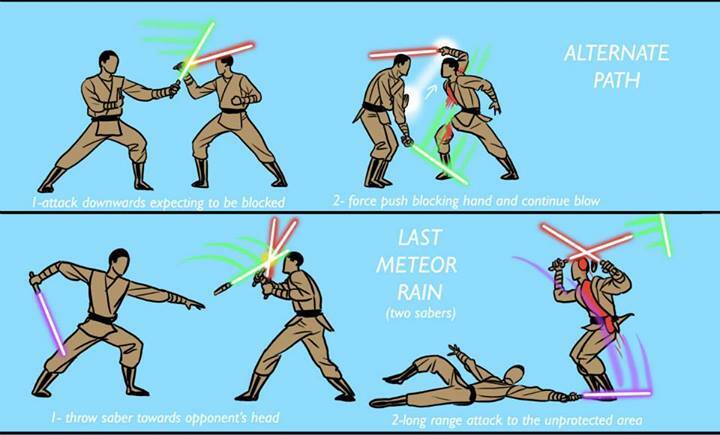 Wow, it takes a lot of setup to explain a light saber duel, but we have all of the ground rules in place. Both parties are defined to be "strong minds," so they have many layers of intent. The game is technically decided by the physical state of the world (first to put a lightsaber through the other without dying, themselves, wins), but that game is played with "perfect knowledge." Both parties know the exact limits of motion for every joint. Both parties have an onion like set of layers of intents. The inner layers are inaccessible to the other (strong minds), but the outer layers may be suggested to by acting in a way which encourages those layers into a suggestible position. The Jedi will attempt to move in ways which suggest the Sith no longer oppose the Jedi's true goals, and vice versa (which tends to involve a lightsaber burn, but doesn't have to -- see the end of Return of the Jedi!). Each party may act in a way which makes a very obvious suggestion (which is powerful, but easily detected and corrected for) or a very subtle suggestion (which is less powerful, but much harder to uproot). These suggestions can be done at outer layers (where it's easy, so obvious suggestions are fair game) or inner layers (where it's much harder to influence, so subtle suggestions will dominate). Game theory suggests how to play this game. If you can find an outer layer for which an obvious suggestion is sufficient to permit you to not-loose, take it. This happens all the time when facing Storm Troopers - all you have to do is move in a way which encourages them to miss all the time. However, a Jedi or Sith who has such weakness is a very weak force-aware indeed. The force should have warned you about such weaknesses long ago. Accordingly, any weakness you see in early combat is likely a trap designed to catch the less enlightened. If you try for the easy victory, influencing the "trapped" chink in their armor, the motion you used to influence it may spell your undoing, as they influence you more subtly, preventing you from causing them to lose. Jedi and Sith battles focus at the inner most layers that each can observe in the other. Accordingly they are incredibly subtle. If you can be more subtle than the other party, you can influence them in a way which eventually prevents you from losing (which may involve a joint mobility limit which permits you to kill them). We can use this information to see more into what the strikes must look like. When you see a strike that isn't a deathblow, its goal is clearly to get more information. If you can learn more about the inner layers of intent of your opponent, you can subtly influence them at more inner layers. This means, with each strike, the Jedi remains sensitive to what the opponent is doing. When the opponent successfully blocks the attack, the way they block the attack can reveal information about inner layers which the Jedi could not otherwise pierce. For example, if the block reveals a Sith inner desire to strike at the lower right quadrant of the Jedi, the Jedi can offer "opportunities" in that quadrant which don't cause the Jedi to risk losing, but permit the Jedi to learn more about the Sith. This would suggest that the violent uncontrolled swings of Anakin vs. Count Dooku were not the swings of a Jedi, but a fool masked by anger because they put his senses in a very poor position to analyze the way Dooku's blocks "felt." Likewise, this also points out that the taunts in combat are actually valid combat techniques. While taunting may be seen as a cheap way to make lesser opponents make a mistake, at the skill level of the Jedi and Sith, words may be as effective at subtle influences as a lightsaber is. The long strung out fights with many blocks and parries may be realistic! Modern fighting theory suggests that most fights are over within the first few blows. However, modern fighting theory is not studying Jedi, with their extraordinary levels of perception. In a Jedi fight, you aren't always fighting to kill the other guy; you're fighting to get information about them so that you can influence them in a way that ensures you don't lose. This can lead to much longer fights than happen in more realistic circumstances, with less super-aware individuals. What's the ultimate Jedi/Sith lightsaber battle? It's actually really boring to watch, because it is too subtle for us. I borrow from the stories of a Chinese internal martial art called Tai Chi. Two great masters of the force met to determine whose mastery was greatest. They stood and faced each other, staring the other in the eye. They stood there for the longest time, never drawing their lightsaber, never twitching a muscle. Finally, both smiled, bowed, and walked off. Why do I suggest this is the ultimate lightsaber battle? Consider, neither one would like to leave their ultimate victory up to chance. Not-losing is more important than winning. In the ultimate lightsaber fight, both parties influence each other so subtly that even the drawing of the lightsaber is superfluous. Eventually they identify a way to proceed in which both parties do not lose, and they go on their way. The best way to fight with a lightsaber, in general, is to fight dirty. Fight like a sith. In a comment, TrEs-2b provided a link to some excellent dirty lightsaber fighting techniques. I take no credit for these images; as far as I can track down, they were created by Pere Pérez, who has some other work showcased here. 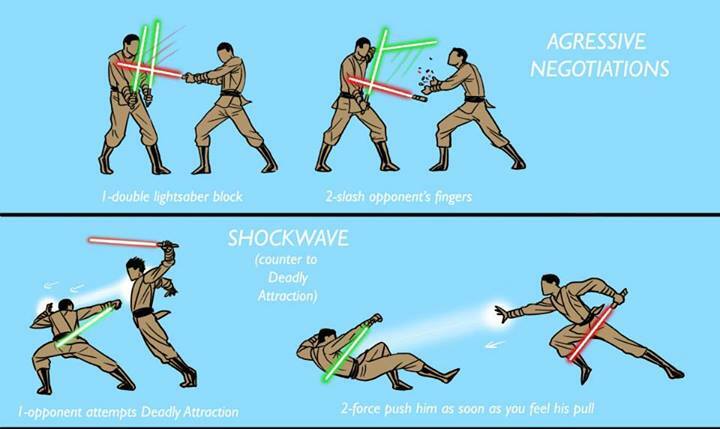 Several of the moves depicted below require the lightsaber to turn on or off in a very short time. How quickly a lightsaber activates is a bit of a debate (about Star Wars universe! No way! ), but I think the question is well answered here, clearly showing that such rapid activation is possible. Cort Ammon's brilliant answer can only be expanded on with one regard: observation of the other. Samurai sword duels between high ranking masters would resemble the initial duel between Kyūzō and an unnamed Ronin in the early part of the Seven Samurai. The two face off and select their initial positions, then there is a long pause before a sudden flurry of motion. Kyūzō simply announces "you are dead", which enrages the other ronin and they replay the duel with live blades in place of the bamboo used earlier. Sure enough, a setup, a long pause and a sudden explosion of action leaves Kyūzō standing and the other ronin lying dead in the field. Breaking this down, we see the two ronin observe each other, select a starting position (based on both their training at whatever dojo they belong to and what they observe of the other), then the pause where they select a strategy and wait for some sort of signal (a muscle twitch, a shifting foot) that might indicate the initiation of the attack. A more modern version of this can be seen in the movie "After the Rain" (Ame agaru), where the hero, another ronin named Ihei Misawa is being tested for a job as the fencing master for a local lord. Once again, the master (Ihei Misawa)observes the opponent, to the point of simply shifting his weight to avoid oncoming sword blows, before engaging in a swift movement to disarm his opponent (striking the opponent's blade from their hands). A final example is a legend from Japan, where a tea ceremony master is challenged to a duel by a samurai for some real or imagined slight. At the insistence of Lord Yamanouchi the daimyo of Tosa Province, a reluctant tea master was taken to Yedo (Yedo is the feudal name for the modern city of Tokyo.) on an official trip attired in samurai garb, including the two traditional swords of the warrior class. While running an errand for his master in the city, the tea master was accosted by a ronin (A ronin is a masterless samurai, literally a wave man (one who is tossed about like the waves on the sea). Lacking a benefactor, many ronin took up criminal endeavors to support themselves.). Since he was by himself and dressed beyond his station, this was exactly the thing the tea master feared might happen. The tea master thanked the sword master and went on about his business. The next morning when he went to meet the ronin, he followed the sword master’s advice to the letter. The tea master boldly stood before his opponent, the embodiment of concentration. The ronin, who had previously seen a coward, now faced the personification of bravery. Instead of advancing to attack, the ronin retreated. Cowed with fear inspired by the superior concentration of his adversary, he turned and fled. After standing a while and hearing no shout, the tea master opened his eyes to gaze upon an empty street. 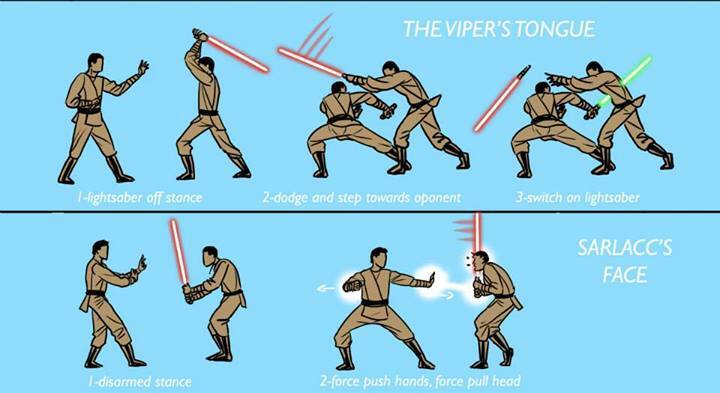 Using this construct, the two light sabre wielders would face off and pause,using both normal senses and the "Force" to determine the state and intentions of their opponent, before suddenly making a move. Buy/create ~20 Lightsabers. Attach each of them to a floating drone (these are fairly ubiquitous in the SW universe). Set them up so the lightsabers spin around randomly and flicker on and off at a high frequency - this will allow them to "bypass" other lightsabers. Make sure you encode them so they won't accidentally destroy each other. When dueling another force users, activate all the drones and send them at your opponent. They should en-globe and them move in. Use your own force powers in a defensive/support role, to make sure they can't just easily take your drones out. Recall them when your opponent has been effectively mince-meated. It seems like the most interesting combat would be that which treated the lightsaber as a "complete" weapon, taking advantage of its unique properties, rather than just a glorified sword. Samuel's illustrated answer demonstrates some of these, such as its ability to be quickly switched on and off, and its "infinite sharpness" (and vulnerability of its wielder to having parts of their body force-pushed/pulled into it). The lightsaber is not a ranged weapon. This might mean that lightsaber duels would start by the opponents attempting to close on one another as quickly as possible, so as not to give the other the time to turn on their lightsaber and get into a defensive posture. This could result in elements of a more traditional hand-to-hand fighting style. In close-quarters hand-to-hand combat, a lightsaber that has yet to be turned on would be much more like a firearm than, say, a knife, in that it would be no deadlier than a blunt instrument, but anything that gets in front of its opening could be destroyed. That could lead to an interesting combat style like the "gun kata" demonstrated in the final scene in the film Equilibirum -- the focus was not on disarming your opponent, but in bringing your pistol into an orientation where it would be pointing at some part of the body of your opponent, so you could fire. Use of the Force largely renders this question moot, as you could use it to simply switch off your opponent's lightsaber, or more permanently mis-align/damage its internal components so it no longer worked. It's also a much more elegant & low-effort attack to tug a crystal a few millimeters off-center than it is to force a large appendage of a strong person in a direction it doesn't want to go. In any event, it's certainly a compelling reason to use a more conventional melee weapon. I like all the thought from the other answers but wanted to add something. 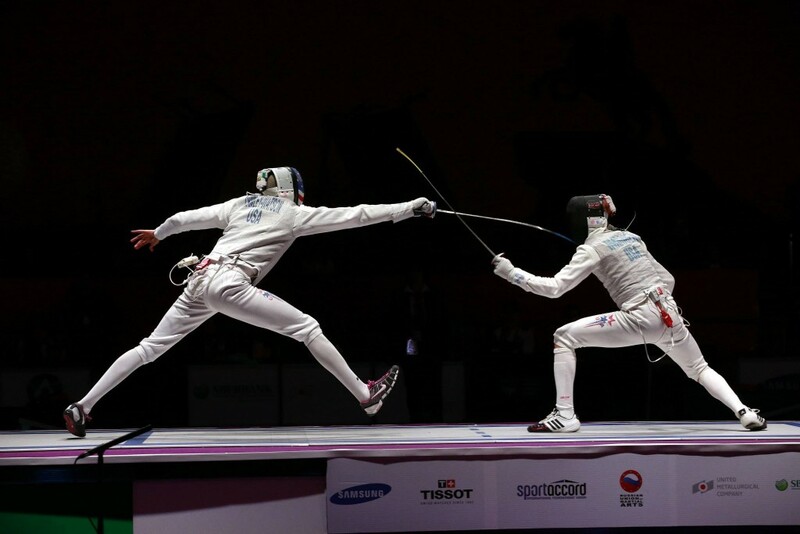 A light saber is deadly whether you swing in an arc (like a saber) or stab with the point (like a foil / epee). If I was fighting with a light saber, I'd fight using foil / epee fighting techniques. It is much easier to block a swing of the sword than it is a stab. Anyone dropping his guard long enough to take a swing at me would be instantly skewered. It won't let me post an animated gif so here's the link. The touch need not be pretty either. A lightsaber is lightweight, with most/all of that mass in the hilt. It also basically ignores armor. So it's more like a fencing sword than like a medieval broadsword. Why are fighters swinging it around like they need momentum to hack through metal armor? Assuming I have a standard lightsaber and am not using the tricks discussed above, I'll use a fencing style. Stand with my body nearly sideways to the enemy, to present a small target. Use quick stabbing attacks rather than slashing. The hilt-based center of mass makes it easy to wiggle the blade around quickly to parry, and the absurdly sharp blade means I can score a killing blow with one poke instead of slashing. Or, a poke and a flick of the wrist to sever a limb/wreck an organ. All I have to do is parry and touch you to cause injury, so big swings are pointless and leave me vulnerable. Also, don't rule out mundane dirty tricks. Sand in the face. A cloak in the off-hand to hide attacks or throw at the enemy's face. (This is the original "cloak and dagger" style.) For that matter, why not have a blaster in the off hand? Sure you can parry the shots, but can you do it while our blades are locked? (I assume we somehow don't have gunpowder weapons, which are way faster than blaster shots.) If I've got telekinetic powers, why am I not standing back and throwing furniture at you too? Final, silly thought: how long can you make a lightsaber? I'd prefer a pike-length one to those fancy multi-blade designs -- or even a regular saber on a spear if the blade itself can't be made longer. Force users can use the force to pull and push objects. 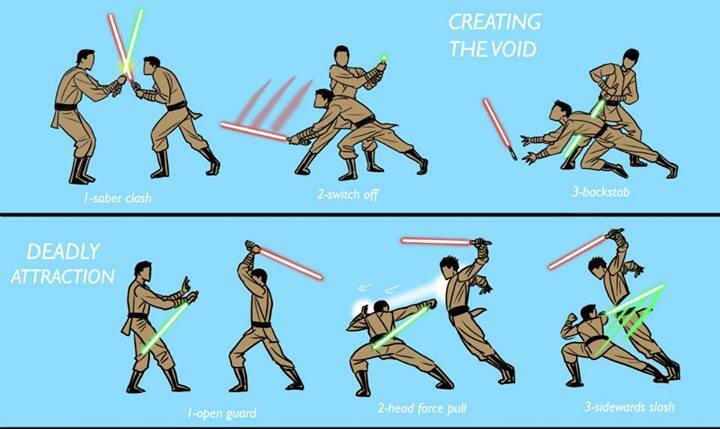 Why not just simply throw the lightsaber, and use force powers to simply align it to go through your enemy? It's easier to surprise someone with a ranged weapon. Very little sneakiness required! 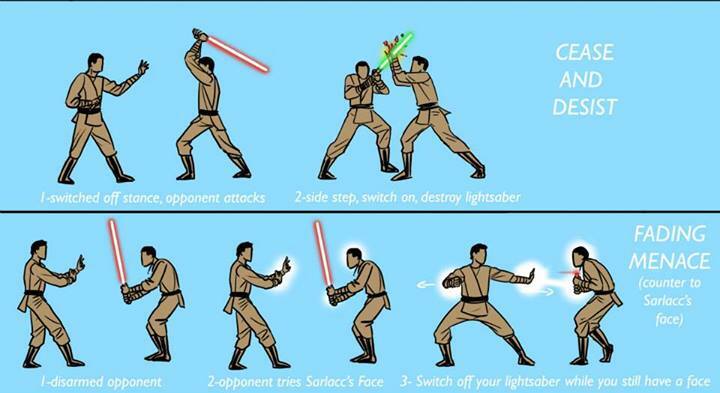 Your opponent cannot strike back; their options are to use their lightsaber to deflect yours, or dodge. If you can turn the lightsaber on from a distance, you can throw it, and then turn it on for extra surprise! You've thrown your weapon! (Again!) How will you defend yourself from blaster shots or another opponent if your lightsaber is way over there? Maybe jedi can sense the force being used? If so, they could sense the force-guided lightsaber missile coming at them. Also, if the force allows some pre-cognizance, your thrown weapon give them even more reaction time! The main difference, I think, is that you don't need to apply any strength at all. The gentlest touch will cut through any armor. In some places, sports Battle gaming rules work in the same fashion. I.e. The slightest touch in any valid part of the body (head usually not included), or event clothing, counts as a hit. 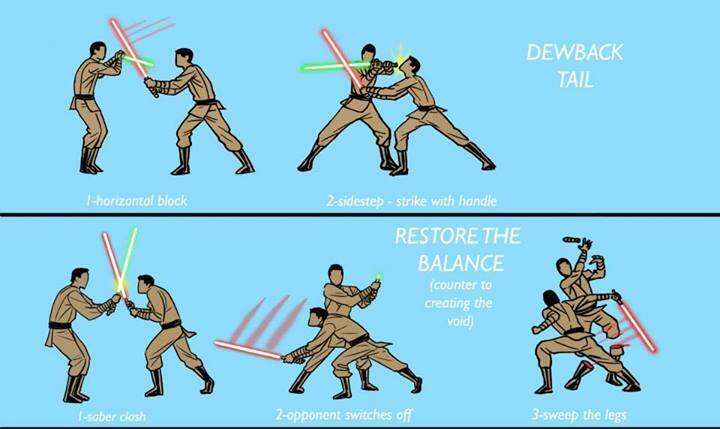 I think this could give us some hints about how a real lightsaber duel would work, but we need to have some important differences in mind. Sports battle gaming is a competitive sport, and you are rewarded for hitting the rival before he does the same to you. With a light saber, if the rival hits you later you are dead anyway. So it must be a lot more defense-oriented. And of course, you must protect the whole body. I'm not sure how this would affect fighting, but as Cort Ammon said in his answer, Jedis and Siths aren't know for trusting luck. I guess they would be really, really conservative, slowly circling around each other, examining carefully each other's movements, from a safe distance, before entering a really fast and lethal combat. My HEMA experience suggest most duels would end with amputed hands, as that's the nearest target and after blocking a blow, you can just slide your laser blade through the other weapon until you just cut the hand. Since a lightsaber is sharper than even the sharpest metal sword, many advanced techniques would fail (there are many were you have to touch your opponents or your own blade). These techniques are mainly used to break an opponents attack and counter it. Also many standard blocks and attacks would fail, due to the lack of a guard (especially the "winden" techniques). What stays are the standard techniques of attacking and blocking that don't use your body parts or guard, which is a very limited set. 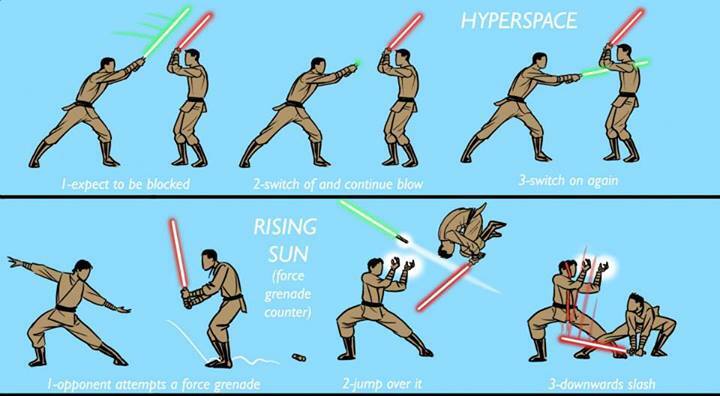 Dodging would be much more important, especially considering Jedi and Sith have faster reflexes than normal beings, can jump higher, etc... Considering this, I think that lightsabers are the only melee weapons where the hollywood style of fighting with dodging and jumping all the time is somehow even quite plausible. Ref. : My own experience as a HEMA (Historical European Martial Arts) Practitioner. My understanding of lightsaber duels was that it was impossible (or nearly so) for anyone OTHER than force users to use lightsabers. Jedi/Sith used the force to feel both the location of their blade, as well as the location of the opponent's blade in much the same way they "felt" incoming blaster bolts and deflected them. Powerful Jedi/Sith were able to "mask" this detection of their sabers, thereby making it harder for the opponent to track and deflect attacks. In addition to feeling the location of the physical blade, Jedi/Sith would also feel their opponents intent, and also would use their precognizance (similar to little Anakin's seeing the future in pod-races to make split second reactions) to help them determine how and where to strike. The opponent would also be attempting to use the force in this manner, and each would be attempting to "block" the signal, so to speak, so as to obscure their own moves from their opponents. This, coupled with the Jedi's lightning fast reflexes and the inherent weightlessness of the blade, meant that they could move extremely quickly, while still being able to block and parry 99% of the blows from their opponents. So, yes, due to this, saber duels BETWEEN FORCE USERS would look like it does in the movies. Between everyday common people, however, they would be just as likely to kill themselves with the weightless saber blade as to kill their opponent. Not the answer you're looking for? Browse other questions tagged weapons combat or ask your own question. Is it more likely that merfolk would evolve with horizontal or vertical tails? What is the most likely shape of a Super Sword? What type of weaponry with the minimal amount of force would be appropriate to kill and subdue a superhuman?